Caspar Veldkamp is a very active diplomat, who serves as an Ambassador of the Netherlands to Greece the last 2,5 years. He strongly believes in the creativity and talent of the Greek young people, who have the potential to inspire and “modernize the country through their ideas”. Therefore, he is especially proud of Orange Grove, an initiative taken by the Dutch Embassy in 2013, which has grown throughout these years into a “fully-functioning start-up incubator”. In our conversation, Greece’s current economic situation and growth could not be left out. Caspar Veldkamp points out the need for Greece to improve its competitiveness and expresses his expectation to see the country standing on its own feet by August 2018. Mr. Ambassador, after the recent inauguration of the new Dutch government, which are the current priorities of the Dutch embassy in Greece? Our priorities in Greece remain the same: the Eurozone and migration. These are topics that are relevant to all of Europe. We all want to see Greece moving to healthy economic circumstances. We all want to keep the migration situation under control, in a more humane manner. Because Greece is part of the Eurozone and the Schengen-area, we are part of the same European family: what happens here, affects us too. In the light of the recent briefing of the Dutch parliament by the European Commission’s mission chief for Greece’s bail-out program, Declan Costello, how do you see the growth prospects of the Greek economy in comparison to the previous years? Greece’s growth has returned last year and is forecasted at about 2.5% this year. To continue on this path, reforms should be sustained. The economy needs to increase competitiveness. We need ambition for that. At this moment, Greece is ranking very low in the Global Competitiveness Index, for example. It is at position number 87 in the world in terms of competitiveness, below such countries as Ukraine and Algeria. I believe that is not good enough for a country in the Eurozone. The Greek economy needs to continue to be modernized, not only by the government but also in the private sector. Companies should allow for more competition to take place. That would also help to lower prices for consumers. Many products in Greece are more expensive than similar products in my country, even though Greek wages are much lower! This is not acceptable, neither from an economic nor from a social point of view. It requires opening up cartels and breaking down barriers in product markets. The OECD is helping Greece on such matters. When do you consider Greece’s return to the markets as realistic? Greece is already taking steps in returning to the financial markets. This is gradual process. As it stands right now Greece will exit the program in August. We hope to see Greece standing on its own feet by then. This means that no further loans from the European institutions will be needed. But please be reminded that markets or institutions alike will want to see that Greece continues modernizing itself. Mr. Ambassador, on which fields is the investors’ current interest focused in Greece? From the Netherlands, most large companies have stayed in Greece during the crisis. Companies such as Heineken and Friesland-Campina, the dairy company behind the Nou-Nou brand, have continued to invest in keeping their factories up to date. CEOs of some major Dutch companies, such as Philips, have come to Greece again last year and discussed new opportunities. For foreign investors, completing the reforms is of symbolic as well as of practical importance. For example, setting up a cadaster is important. An investor who wants to build a new factory would rather go elsewhere and invest in Portugal or Slovakia if a well-functioning land registry is not present in Greece. To move on to another crucial issue, we live in a time of frequent reports of terrorism. Europe has witnessed an increase in terrorist activity since 2015. What more needs to be done to keep citizens safe? More cooperation is needed in Europe, between intelligence services, police and judicial authorities. My Embassy has been reinforced with a police liaison, to combat people smuggling networks in the migration crisis, reinforce cooperation in counter-terrorism and the like. We need to be vigilant and never naïve, especially since some jihadist fighters would now want to travel back to Europe from Syria. At the end of our conversation I could not leave out Orange Grove, which aims to promote entrepreneurship and support young men and women from Greece and the Netherlands in this field. How would you rate the start-up incubator’s progress so far? Orange Grove has grown into a fully-functioning start-up incubator. It provides start-ups with training, for which we fly in experts from Amsterdam. It has a network of mentors from private companies. We have two ‘entrepreneurs in residence’: successful entrepreneurs from abroad who coach start-ups about matters such as writing a business plan and the best way to approach potential clients. 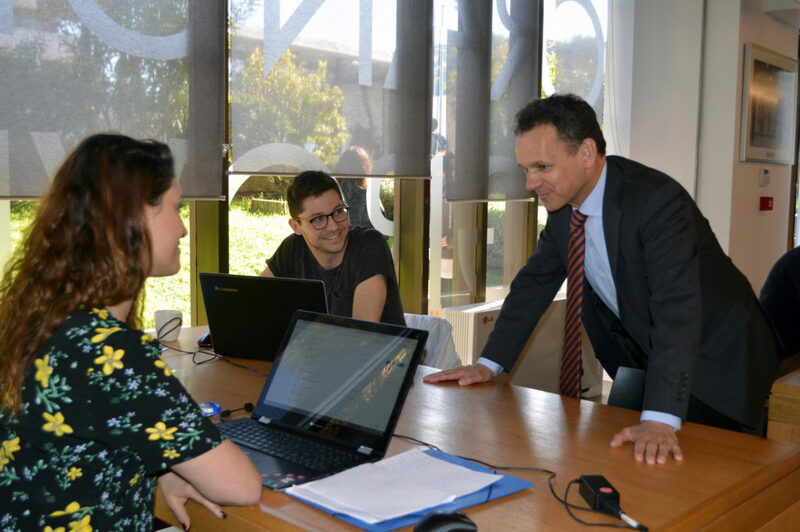 At Orange Grove, a fully-functioning start-up incubator, which supports young men and women from Greece and the Netherlands in the entrepreneurial field. Several times a year, Orange Grove organizes a pitching competition for startups. The winner receives 15,000 euro, as seed money to help the start-up grow. The runner-up wins 10,000 euro. It is always a great event, with a lively, informal atmosphere. The next one is on March 8, International Women’s Day, and focuses on female entrepreneurship. The jury will be made up of female experts from California and Greece. Everyone is welcome! I am impressed by the young Greek entrepreneurs that are working at Orange Grove. There is much talent and creativity among young people in Greece! I believe Greece needs a new generation of entrepreneurship, which is not about protecting established markets but about inventing new ones, about generating new ideas. We need innovation and a start-up mentality to refresh the Greek economy. Start-ups are not only needed to create jobs, but also force larger companies to think more ‘out of the box’. I am impressed by the young Greek entrepreneurs that are working at Orange Grove. There is much talent and creativity among young people in Greece! I am seeing a lot of recognition for what Orange Grove has achieved. Greek politicians from left to right have come to meet the start-uppers, who feel free to tell them about the bureaucratic obstacles they still face. We have to listen to these enthusiastic young people. I have confidence in the young people of Greece, of which thousands study at Dutch universities by the way. We can learn from their ideas how to modernize the country. Caspar was born in 1964 in Etten-Leur, The Netherlands. His educational background includes graduate and doctoral studies in public administration in the USA and the Netherlands. Since 1993, when he entered the Ministry of Foreign Affairs in The Hague until 2011, he has served from various key positions, notably on European affairs and regarding the UN and international financial Institutions. 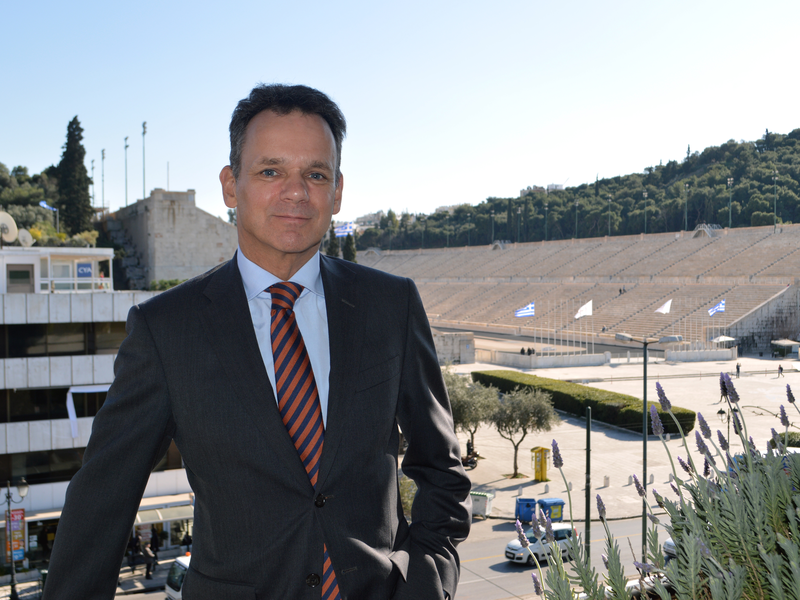 Caspar represented the United Kingdom of the Netherlands as an Ambassador to Tel Aviv, Israel from 2011-2015, year, when he sworn in as an Ambassador to the Hellenic Republic.